Why did Fr. Justin love and honor the Blessed Mother so much? Why did he totally entrust our congregation to the sovereign protection, royal superiorship and maternal care of the Blessed mother? For Fr. Justin, the most special function of Mary is to form souls according to the heart of God, as God wants them, as God desires them to be! The vocation of Mary is to form Jesus in every soul, and to make every soul not only holy as to be Jesus, to make it another Jesus, but also to make it another formator of Jesus, to form soul-spouses of God and this is also our vocation according to Fr. Justin. Fr. Justin convinces us to examine our obligation to reserve a part of our day for an intimacy with Jesus and deepen our devotion to Mary, mediatrix of all graces, queen of all saints and mother of divine love, patroness of our congregation, this three-fold title we use to address Mary at the beginning and at the end of our prayers. She is the channel through which all graces flow. All graces come to us from the heart of Mary and through the hands of Mary. Fr. Justin was strongly convinced that it is very important to find and to keep ourselves, as much as possible, close to her hands and in her immaculate heart. Fr. Justin knew how to appreciate, promulgate and practice all the liturgical, ordinary and extra-ordinary Marian devotions such as recitation of the holy Rosary, the use of scapular, miraculous medal, novenas, pilgrimages and others. He was a member of the confraternity of the most holy Rosary and had worn the scapular of our lady ofMount Carmeluntil he died. In addition, Fr. Justin had a great devotion to the Miraculous Medal. On November 27, 1937, he wrote in his “Book of the Soul”: Feast of the apparition of the Miraculous Medal, and he said; “the Miraculous Medal has freed me from the repulsiveness and fear of my physical cardiac ailment while I was praying the rosary. Fr. Justin wrote and stated: “It was given to me the certainty that the Blessed Trinity has given the Blessed Lady the Office of Immediate Superior of the Society of Divine Vocations, present and working in our midst in all the offices and in all our houses, studies, works, and everything. 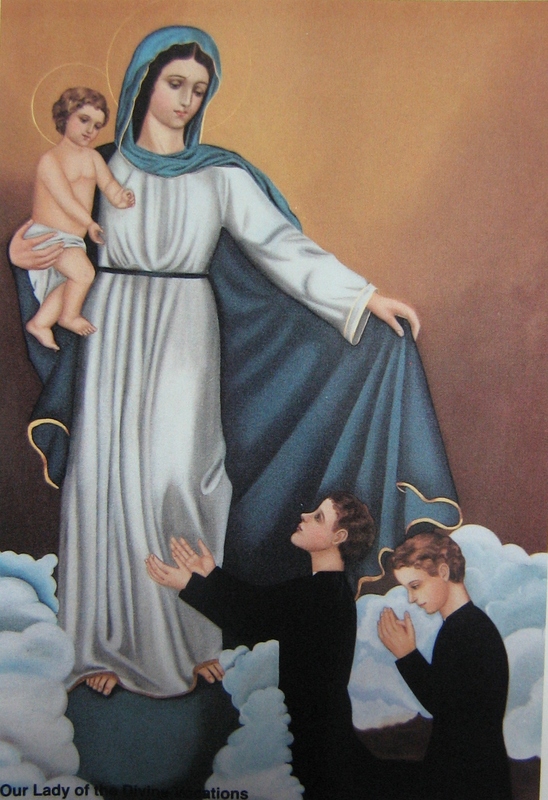 On February 11, 1932, the blessed mother visited and spoke with him, and on May 11, 1932 was established as the Feast of the Superiorship of Mary Most Holy in our congregation. According to Fr. Justin, “God could never be alone. Wherever God is, the whole heavenly court is with him. Since God is everywhere and Mary is always with him, our faith in the special presence of Mary everywhere is justified. Our lady is truly present especially in the room dedicated to her. Then, he said; “remember that the Blessed Lady is your mother and takes care of you. Every evening she passes by your bed, and aside from tucking you in to make sure that you are well covered, she smiles at you and blesses you. Let us not make our heavenly Mother sad with our shortcomings. The blessed mother visits every soul especially those who wait to be sanctified, those who are blessed with a religious and priestly vocation and still more to those who nurture vocations. He said that we can learn the perfect devotion to Mary from someone who knows her, the angels and the saints. Fr. Justin noted that the Blessed Trinity has honored and loved Mary, has chosen her from all eternity, choosing her as daughter of the Father, spouse of the Holy Spirit and mother of the Incarnate Word, Jesus Christ. There is no other person on earth and in the heavens destined to be like her. Therefore, he strongly recommends each one of us to deepen and nurture our devotion to Mary, and to unite ourselves to the respect and love that the Father, Son and Holy Spirit have for her. Our spiritual life, every act, every work, every devotion must lead to and be transformed into prayer. We should honor her, Queen of all Saints, Mother of divine love, Mediatrix of all graces and our Lady of Divine Vocations, inspirations and missions. The blessed mother helps us and offers us her example, the fiat of her heart to the heart of Jesus, to the will, glory and love of the Blessed Trinity. Fr. Justin continued in his “Book of the Soul”; “Mary is the rich earth, all in her, everything in her, men, women, cities, empires, life, and EVERYTHING! To her we have to entrust all divine seeds of grace, of works and of any good so that they may bear fruit. The blessed mother with God the Father is all maternal mercy and goodness, love and sweetness towards every soul. That’s why all of the saints including Fr. Justin, our founder had special love and devotions toward her, and so let’s constantly remind ourselves of the important role of Mary in our religious life as Vocationists, and remember Fr. Justin’s recommendation to deepen and nourish our devotion to the Blessed Mother. Fr. Justin M. Russolillo, founder of the Vocationist Fathers, Sisters, and Apostles of Universal Sanctification was beatified on May 7, 2011 @ 3PM in Pianura (Naples), ITALY. Blessed Justin, pray for us! Caputo, Fr. Louis. Vocationist Marian Devotions. Edizioni Vocazioniste Via D. Giustino Russollilo 14 – 80126 Pianura – Napoli. May 2010.